The famous Khyber Rifles is part of the Frontier Corps. The Frontier Corps is a paramilitary force that includes regular army officers. By 2008 the Pakistanin government had put in place proposals to improve the training of the force, make it more professional and expand it to about 100,000 members. Most of the rank-and-file Frontier Corps personnel are members of Pashtu tribes and have ties on both sides of the Pakistan-Afghanistan border. The Khyber Pass is the most important of the passes which lead from Afghanistan into India. It is a narrow defile winding between cliffs of shale and limestone 600 to 1000 ft. high, stretching up to more lofty mountains behind. No other pass in the world has possessed such strategic importance or retains so many historic associations as this gateway to the plains of India. The Khyber has been adopted by the British as the main road to Kabul, but its difficulties (before they were overcome by British engineers) were such that it was never so regarded by former rulers of India. The old road to India left the Kabul River near its junction with the Kunar, and crossed the great divide between the Kunar valley and Bajour; then it turned southwards to the plains. During the first Afghan War the Khyber was the scene of many skirmishes with the Afridis and some disasters to the British troops. In July 1839 Colonel Wade captured the fortress of Ali Masjid. In 1842, when Jalalabad was blockaded, Colonel Moseley was sent to occupy the same fort, but was compelled to evacuate it after a few days owing to scarcity of provisions. In April of the same year it was reoccupied by General Pollock in his advance to Kabul. It was at Ali Masjid that Sir Neville Chamberlain's friendly mission to the amir Shere Ali was stopped in 1878, thus causing the second Afghan War; and on the outbreak of that war Ali Masjid was captured by Sir Samuel Browne. The treaty which closed the war in May 1879 left the Khyber tribes under British control. From that time the pass was protected by jezailchis drawn from the Afridi tribe, who were paid a subsidy by the British government. The Khyber Rifles were originally sponsored in 1878 by the famed "Political Agent" Colonel Sir RobertWarburton, and commanded by an Afghan officer in British colonial service, MajorSardar Mohamed Aslam. Initially armed with local jezail muskets and wearing local clothing distinguished by red cloth badges, they were eventually regularized with modern weapons and uniforms as theexperiment proved successful. 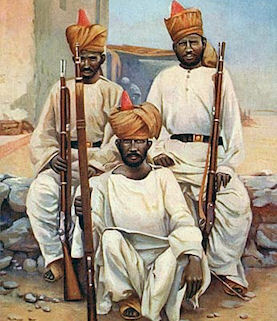 The Khyber rifles were organized along purely military lines, with military ranks. They maintained outposts of platoon and company size as a security screen for a larger force which was maintained to conduct punitive raids or counterattacks against any large scale threats or penetrations. For 18 years, from 1879 onward, Colonel R. Warburton controlled the Khyber, and for the greater part of that time secured its safety. He turned the rude levies which formed the Khyber Rifles into a fine corps, ready to serve the Indian government wherever they might be required. He made the road safe, kept the Afridis friendly, and won the thanks of the Punjab government, expressed in a special order upon his retirement, for his good work. Warburton's term of office came to an end synchronously with the wave of fanaticism which swept along the north-west border of India during 1897. When the Afridis began to cause anxiety in 1897, Colonel Warburton was asked by the government of India if he would assist in quieting the excitement among them. He declared himself ready to do so, but in the meantime the trouble had come to a head. The Afridis were persuaded by their mullahs to attack the pass, which they themselves had guaranteed. The British government were warned of the intended movement, but only withdrew the British officers belonging to the Khyber Rifles, and left the pass to its fate. The Khyber Rifles, deserted by their officers, made a half-hearted resistance to their fellow-tribesmen, and the pass fell into the hands of the Afridis, and remained in their possession for some months. This was the chief cause of the Tirah Expedition of 1897. Colonel Warburton took part in the campaign which followed; at its close his active career ended. Warburton occupied his leisure in retirement by writing his memoirs, Eighteen Years in the Khyber (1900). The Khyber Rifles were afterwards strengthened, and divided into two battalions commanded by four British officers. Although it lasted only 1 month, ended in a British victory, and is almost entirely forgotten today, the effects of the Third Afghan War (May 1919) were profound in terms of the post-First World War position of British India. Because the War led to the mutiny of the tribal militias (e.g., the Khyber Rifles) that policed the Northwest Frontier of India, the tribes in the unadministered border between Afghanistan and India rose in rebellion. While initially very successful, the loyalty of the Khyber Rifles was eventually undermined by the Amir of Afghanistan and numbers deserted. The Regiment was therefore disbanded as unreliable, and allowed to leave British service at the onset of the 3rd Afghan War in 1919. In Waziristian, which lacked any road communications, the fighting was particularly severe, as the British failed to defeat the now heavily armed tribes. Between late 1919 and late 1921, the Indian Army, its fighting value weakened by wartime expansion and by losses, fought a series of protracted and inconclusive campaigns, each of which involved the equivalent of a division. Not until late 1921 did the Afghans agree to normalize relations with Britain. By assisting the Wazirs and playing off the Bolsheviks against the British, the Afghans won their full independence from the British. The cost of tribal fighting, permanently occupying the Frontier, and building roads precipitated a fiscal crisis in the reformed Indian legislation and made the Army Budget politically contentious. This prolonged budgetary crisis prevented the British from using the Indian Army as widely in the Middle East as they had hoped. The Regiment was reconstituted from Afridi veterans of World War II in 1946 with its headquarters at Landi Kotal. The commander of the reborn regiment was himself an Afridi - Sharif Khan. In August 1947, on Partition, the Khyber Rifles and the other Frontier Corps went to Pakistan. Some films in the historical adventure genre dealt with areas relevant to the contemporary world, especially those depicting the impact of imperialism and the creation of empires. These movies began to proliferate in the the 1930s. Like most classical film genres, in adventure a fictional world is constructed with little relation to the actual facts of imperialism. "The white man's burden" in the empire adventure was presented as a form of service, portraying the colonial system as a way to protect imperiled natives from domestic and foreign enemies, bringing peace and justice to a land where both are endangered. Rebellions are invariably more evil than the status quo, led by those whose goal is not to promote liberation or the best interests of their people but to substitute themselves as the replacement for the colonial master. The genre is sufficiently flexible to allow for only a lukewarm endorsement of colonialism or questioning of its political effects, a tradition going back at least to 1928 and the notable production of WHITE SHADOWS OVER THE SOUTH SEAS. However, this theme only became established after World War II, as films began to reflect the crumbling of western empires in Africa and Asia and recognition grew of the pernicious effects of imperialism and its attendant racism. The first major film signpost of these changes was KING OF THE KHYBER RIFLES (1953), set in the Sepoy Mutiny of 1857, although the book is set during World War I and the Khyber Rifles were not raised until some two decades after the Sepoy Mutiny. The story centers on a character of Eurasian ancestry, Captain Alan King (Tyrone Power), who falls in love with an English girl, Susan (Terry Moore), the daughter of the outpost's commander, General Maitland (Michael Rennie)--providing an opportunity for exploring racial attitudes in a colonial setting. 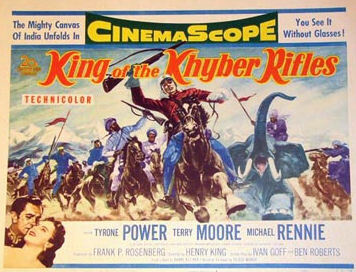 Focusing on a relationship between a half-caste and a white girl was, in the early 1950s, an original cinematic theme, and KING OF THE KHYBER RIFLES was unique for presenting it in adventure. Movies like King of the Khyber Rifles, that depicted weak Indians as compared to strong Englishmen, did not do any good for the image of the Indians.